I make use of a lot of "docks", but they are usually the on-the-water kinds – docks made for boats. The Sigma Dock appears to be every bit as good of an idea as the boat dock. And the question "Why hasn't someone delivered this product before?" immediately jumps to my mind. 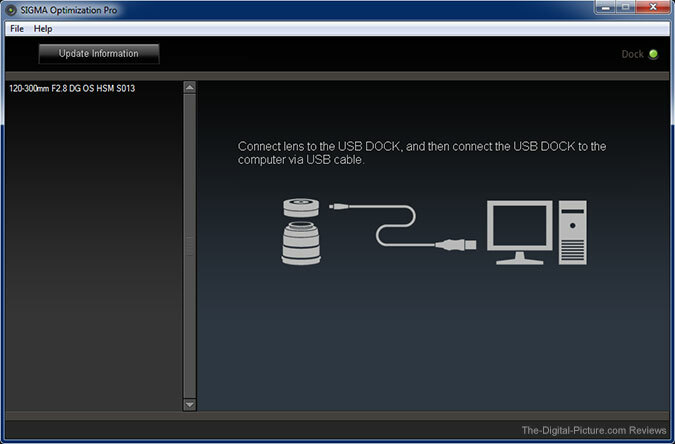 Basically, the Sigma Lens Dock and its accompanying software allow a computer to control lens settings and programming on compatible Sigma lenses. Currently compatible lenses are those in the Sigma Global Vision lineup denoted by "C" (Contemporary), "A" (Art) and "S" (Sports). The dock version is camera mount-specific and available in Canon, Nikon and Sigma versions at review time. The primary function the Sigma Dock addresses is what I consider to have been the biggest issue with the Sigma lens product line (in Canon mount at least). That issue is lens focus calibration. I have and have used a very large number of Sigma's lenses. Invariably, a too-high percentage of these lenses have not focused accurately enough for me. The Sigma Dock, along with the downloadable Sigma Optimization Pro software (SOP), addresses consistent front or back focusing problems – in enough detail to drive us perfectionists crazy. And in far more detail than any current DSLR camera can address through AF Microadjustment. Another function addressed by the dock includes firmware updates. In my Sigma lens reviews (and other third party lens reviews), I warn of potential future compatibility issues. Without the Canon specifications available to them, Sigma must reverse engineer the Canon AF system. Occasionally, a new camera model does not play well with an existing third party lens model. With the ability to update lens firmware via the dock (and an internet-connected computer), some of these compatibility issues theoretically could be resolved, making your Sigma investment more future-proof. With Sigma lenses having the new "Custom" switch, AF Speed, Focus Limiter and OS Settings can also be dialed-in to preference via the lens dock. The Sigma Lens Dock looks something like a hockey puck, but it is far lighter (the USB cable probably weighs as much as the dock itself). The plastic dock has sharp ribbing, but it feels solid and has a metal mount that appears the same as camera's lens mount, complete with connection pins. Using the dock requires Sigma Optimization Pro software, downloadable at http://www.sigma-global.com/download/. On the download landing page, choose your language. Then hit the download button for your OS (Windows or Mac) on the next page. Notice that the 23-page PDF manual is available as separate download. After going through the uncomplicated install process, restart the computer. Place your lens objective-end-down on a stable surface (such as a desk or counter) and bayonet mount the dock to the lens just as you would mount a camera to the lens. Attach the included USB cable to the dock and to the computer. Then start the Sigma Optimization Pro software. Following is what I saw next. I named this screen image file: "0". I started numbering the SOP screen capture image numbers with "0", not because of my heavy IT background, but because "0" best represented my progress with the Sigma Dock until I finally talked to the right person at Sigma USA Support. Screen 0 shows what I saw when I attached both my first and second Sigma Docks. The green light in the top right did not go bright. After many reconnection attempts, using different USB ports and a complete software reinstallation, I still was not able to connect to the docked lens. The SOP software did not recognize the dock with either the Sigma 120-300mm f/2.8 DG OS HSM Lens (from the Sports series) or the Sigma 30mm f/1.4 DC HSM Lens (from the Art series) in it. My first installation was late at night. The next day was a holiday, so Sigma was closed for the day. And they apparently were closed the Friday after the holiday to make a long weekend. That's great for the employees, but ... this review came to an abrupt halt. Friends already using the dock were having no problems, so I guessed that I had a dead dock and ordered a replacement. But, the replacement also did not work. I then talked to multiple Sigma support reps until the right clue arrived – my Logitech Nano Wireless USB Mouse Receiver was conflicting with the Sigma software/hardware. If I disconnected the mouse receiver, the Sigma software worked fine. Hopefully Sigma resolves that bug soon as a mouse is a definite requirement for using the dock. Fortunately, my laptop's touch pad allowed me to keep working. The review moves on to screen "1" with a bright green dock light. When the Sigma software connects to the docked lens, new lens firmware is searched for as shown in "2" with status feedback shown in "3". An internet connection is required for this initial check (further connections to the lens can be made offline). 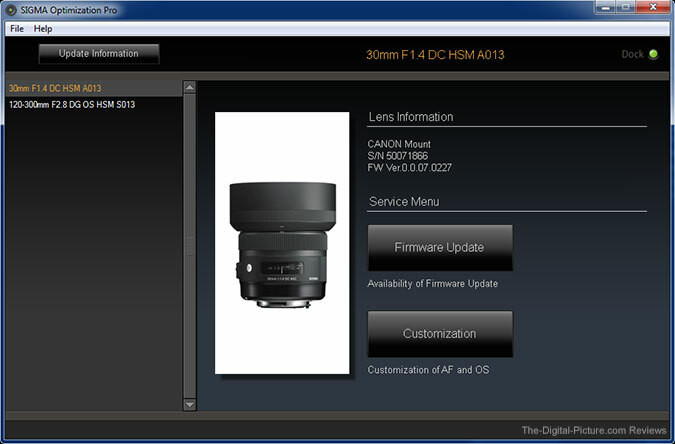 At review time, only the Sigma 35mm f/1.4 DG HSM Lens has a firmware update available for it (a dock compatibility update). You can check to see which updates are available by clicking on the "Update Information" tab on the software download page. Closing out the message box shown in "3" takes the user to the main display for the attached lens "4". You can instruct the software to check for a firmware update or move into the Customization Menu "5". Focus calibration ("Focus Setting") is the software customizable setting available for all of the dock-compatible lenses. Focus can be set at each of 4 shooting distance ranges for fixed focal lenses, and each of 16 ranges (4 focusing distance ranges for 4 focal lengths) in total for zoom lenses "6". As I mentioned before, there are enough options there to drive us perfectionists crazy, But we can totally satisfy our need for high-performance from our lenses. Multiple copies of the same lens are recognized via their serial numbers and can be adjusted individually. The software can also distinguish between a bare lens and the same lens with a Sigma tele-converter mounted. Focus adjustments can be made for all combinations of with and without tele-converter for compatible lenses. Screen captures "7", "8" and "9" show adjustments being made to a Sigma 120-300mm f/2.8 DG OS HSM Lens. Adjustments must be written to the lens to be activated. Clicking on the "Rewriting" button (I would have chosen a different name for this button) takes care of this task with images "10", "11" and "12" showing dialog boxed encountered through this process. For lenses that have a "Custom" mode switch, SIGMA Optimization Pro offers additional customization options for Autofocus and Optical Stabilization. 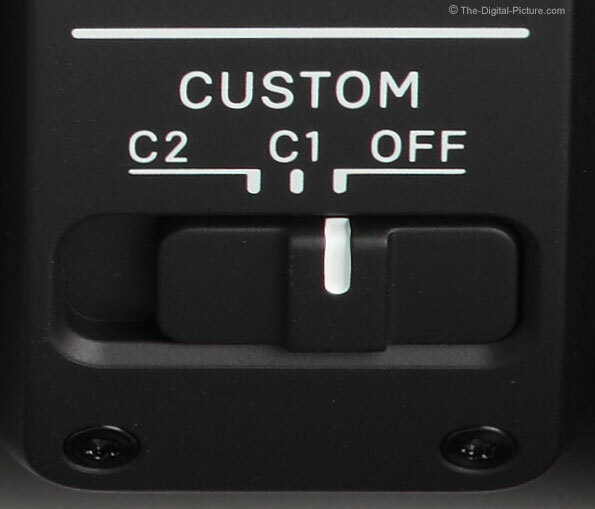 The Custom switch has three positions – 1, 2 and Off. C1 and C2 are able to be individually programmed using the dock and software. These settings are then available for immediate use in the field via the flick of a switch. Taking the "Customization Mode Setting" option on screen "5" lands the user on screen "13" below. On the Customization Mode Setting screen, select the custom switch number to program and screen "14" is presented. The first option is AF Speed Setting. Screen "15" and "16" show the three selectable modes. The second customization option is Focus Limiter Setting ("17"). This feature allows a minimum and maximum autofocus distance to be programmed into the lens as shown in "18". Customization options must be written to the lens using the "Rewrite" button. Screens "20", "21" and "22" show the dialog box progression of this process. Once written to the lens, the customized options can be recalled simply by setting the custom switch. Photographers can quickly choose the lens setup that works best for the current situation. Following is the SOP screen showing a Sigma 30mm f/1.4 DC HSM Lens mounted to the dock. As shown in screen "24", the Customization Mode Setting is disabled for this Custom switch-lacking lens. Non-dock compatible lenses can be mounted to the dock, but you won't get away with anything. The software knows - screen "25" shows. The SOP software is not going to win any graphic design awards, but Sigma has implemented the user-programmability of lenses concept very functionally. SOP is very easy to use. As so often happens, the price is going to get in the way of purchases for some. The Sigma Dock is not inexpensive in my opinion. It is going to be hard to justify buying the dock to use on a single inexpensive lens. The compatible lenses are priced starting at $499.00 at review time. I consider that price reaching into the bottom of the moderate lens price range, so the decision is not cut and dry. The cost of the dock is very small relative to the purchase of a 120-300 OS, which is also more programmable than the current lower-priced dockable lenses. Adding a dock to the 120-300 OS purchase is going to be more easily justified. For those that upgrade cameras and lenses frequently or have many of both, owning a dock makes a lot of sense. Friends, photography clubs and other regional groups purchasing a dock to be shared makes a lot of sense. As I said before, my first thought going into the Sigma Dock review was "why hasn't this product been introduced a long time ago?" A lens dock is a fantastic idea and can save many returns to the manufacturer with shipping costs and downtime savings realized. The additional programmability of some lenses cannot be otherwise obtained. And focus calibration at the level the dock is capable of can only be obtained by sending your camera AND lens to Sigma. Sigma's dock is a great idea.